I have had these shoes for a while now wondering what to do with them. They are so cute, I bought three pairs when we were in Colombia last year. Whilst I was making some more of my simple rose purses I thought the same design would look really cute on the shoes, and I think I was right. 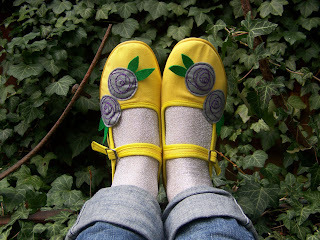 I have black, red and yellow with contrasting roses on the fronts. I am actually tempted to keep them myself but I am gonna be good and list them in my shop. I will see if I can get some more so that I can offer other sizes and also maybe make myself a pair. I love it when you are making something else and you get that light bulb in your head. I got out my sketch book out last night and drew up a new slouchy bag design to go with this range, I will make up some prototypes today. So even though they hurt my fingers a lot hand sewing the roses onto the shoes, I hope they sell well so I can invest in a thimble and make many more. Kitty I will try and get hold of some pink ones specially for you.